The lovely and fun city of Chippewa Falls turns 150 this year, and its Chippewa Falls Sesquicentennial Celebration Kickoff was Monday, March 25th. The celebration continues, especially into this weekend! Okay, sesquicentennial (pronounced “sĕsˌkwĭ-sĕn-tĕnˈē-əl”) is a tricky word. But the events around it for the year will be fun! This first Chippewa Falls Sesquicentennial event to celebrate the city’s incorporation in 1869 is a musical. 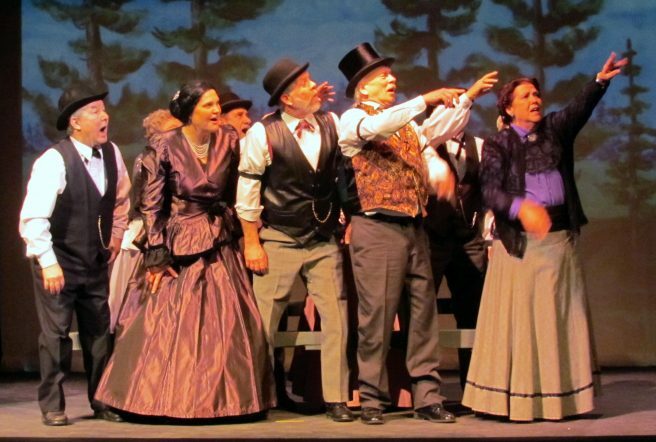 You can experience it at the Heyde Center for the Arts and take a step back in time as the Wayward Players, dressed in period costume, sing songs from CHIPPEWA FALLS 1869: THE MUSICAL on the same date that the proclamation that founded the city was signed: March 25th. Browse through historic photographs, enjoy complimentary snacks and beverages, and talk with city officials and historians about the past, present and future of Chippewa Falls. The Chippewa County Historical Society will have books about Chippewa Falls on sale, a table and display of artifacts from the early 1800s, fur trade re-enactors from the Past Passed Here, and more. The Chippewa County Genealogy Society will be on hand with insights on many of the city’s founding families. At 7:00 p.m. a formal program will be held in the Heyde Center auditorium starting with two songs by the Wayward Players. This will be followed by a brief speech by the Mayor of Chippewa Falls and finally the delivery of the proclamation to Doug Richter, the great-grandson of William Irvine (of Irvine Park fame). Richter will be the Grand Marshal of the August 10, 2019 Pure Water Days Parade in downtown Chippewa Falls. No cost for admission. The musical continues at the Heyde Center later Thursday, March 28th – Sunday, March 31st. More Sesquicentennial events will follow, and we’ll keep you up to date on them! You’ll find the Heyde Center just east (and up the hill) from downtown Chippewa Falls. U.S. 53 and Highway 29 bring you there via freeway and local Business routes. Highways 124 and 178 bring you right in towards downtown!